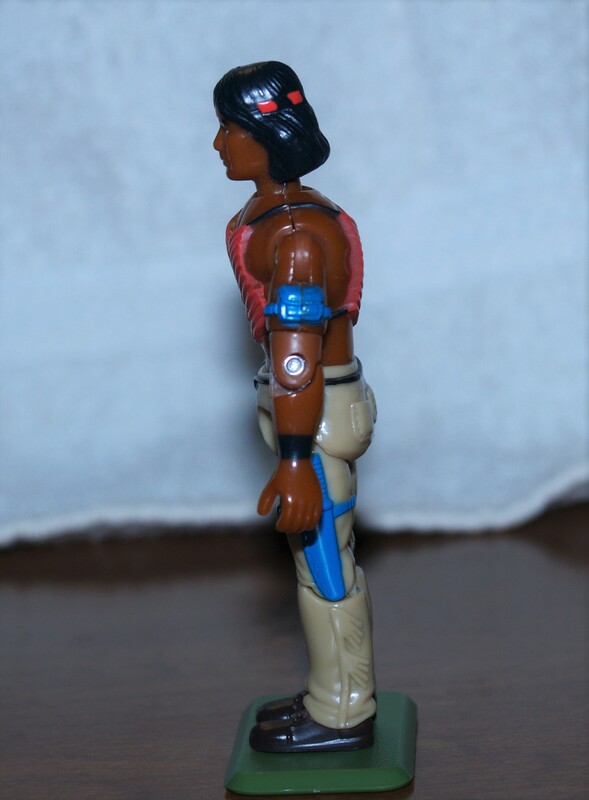 The generic cop that I dubbed Hi-Po might not have been the greatest introduction to Lanard figures via a garage sale, but the other figure I snagged is actually a pretty great figure if you can look past the ridiculously terrible Native American stereotypes around him. I’ve taken to calling him Thunderbird, but your mileage may vary. I figure if it’s a good enough codename for a Native American X-Man character, it’s good enough for this Native American member of The Corps. Starting off with the mold itself, Thunderbird is kind of everything Hi-Po wasn’t. His torso is a tad overly broad, but it’s not nearly as bad because he’s also got some additional height in his legs. He doesn’t look nearly as short and squat as Hi-Po did. The sculpting is also amazing. The legs look fairly basic at first glance. Just a pair of pants with a rope belt and a knife sheath strapped to the left thigh. However, when you turn the figure in profile, you can see the designers at Lanard went as far as sculpting fringe on the pants. Clearly, Thunderbird isn’t wearing sweatpants, but is wearing a pair of Native American buckskins. That’s some pretty impressive attention to detail and the detailing work prints quite well for what could be a small detail. Up top, Thunderbird isn’t wearing a shirt. All he’s wearing is some (rather stereotypical) Native American-styled armor on his chest and back. While I’m not in love with how many stereotypical Native American design elements Thunderbird is checking off, I have to admire the attention to detail on the sculpting here as well. The tight detail work prints nicely and even the ropes used to tie the armor to his body are sculpted well. His arms are mostly bare, though he does apparently take some fashion advice from the Snake Eyes in the form of pouches strapped around his biceps. 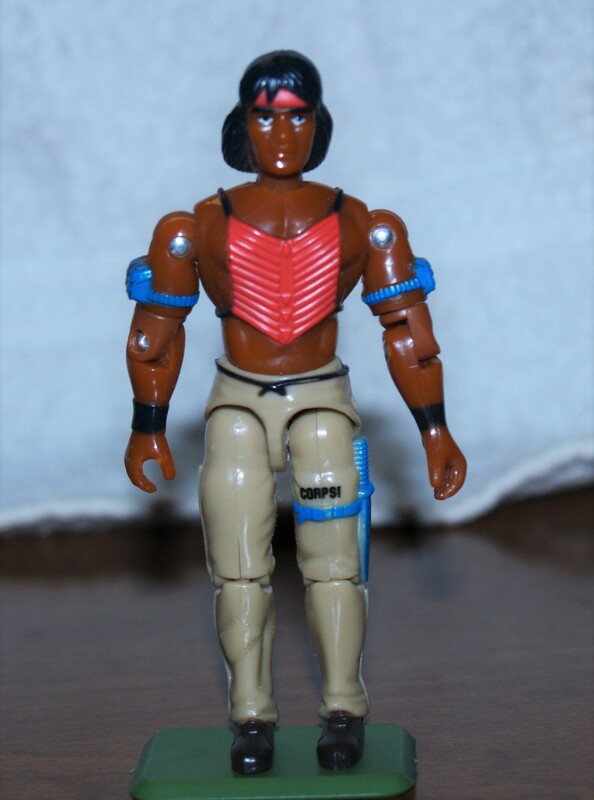 Personally, I’ve always thought that was a weird look, but if you’re going to be running into battle shirtless like Thunderbird here, you’re going to need someplace to carry some extra gear, so around the biceps is as good a place as any. I’m a bit of two minds about the head sculpt. It’s a decent piece, but the detail work is just a tad soft, which also makes Thunderbird look really young. It almost makes him look like he’s too young to join the armed forces in the real world. As such, I think that hurts the design a little, but it’s not a deal breaker. The detailing on the hair is solid, but the slightly too young face just leaves him looking a little out of place alongside my Joes. The paint work on Thunderbird is also far better than it was on Hi-Po. Yes, part of that is due to the fact that Thunderbird’s design is a bit simpler (yet somehow better detailed), but it’s still a better looking figure all around. His shoes are dark brown while his pants are a very light tan. Honestly, I kind of wish the tan were a little darker, but I get that if they made the tan darker it might look too much like his skin color. The sheath on his legs and his bicep pouches are both teal. It’s an odd color, but it actually looks okay with the rest of the figure. Thunderbird’s skintone is appropriately dark for a Native American and that’s definitely one place where this figure has an advantage over any of the Native Americans Hasbro released. 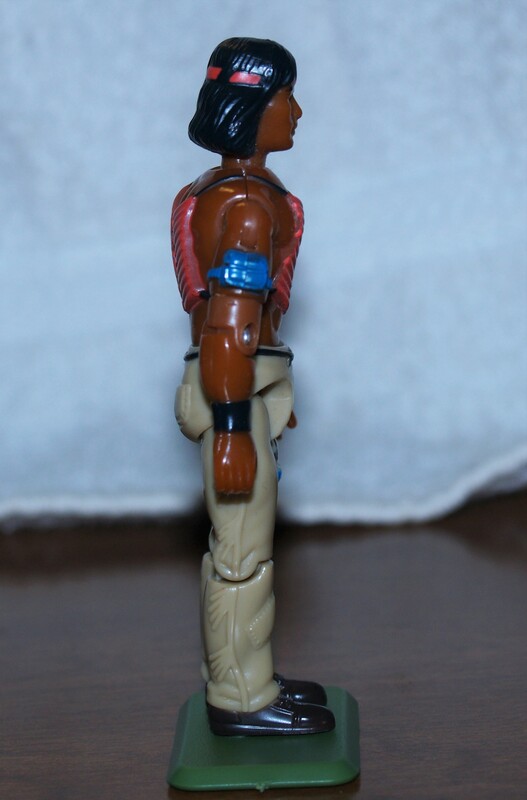 I know that Native Americans can be very light skinned to the point where they look Caucasian, but if you look at Spirit’s skintone in the cartoon and compare it to the action figure, the action figure looks positively pasty. The armor is reddish orange and that color also used on the headband. It’s a solid color, though it’s not the most natural color around. Thunderbird has black wristbands, though they’re just painted on, which is kind of a shame. I think they’d look a bit better as sculpted elements. The paint work on his face is excellent and the eyes are crisply painted. The color scheme is a little bright for my tastes, but it works well with the figure’s design, so there’s not too much room to complain. Unlike some of the other Lanard figures I’m familiar with, Thunderbird feels the closest to a Hasbro release, and that’s definitely a good thing. The detail work is excellent and it’s supplemented by basic yet effective paint work. 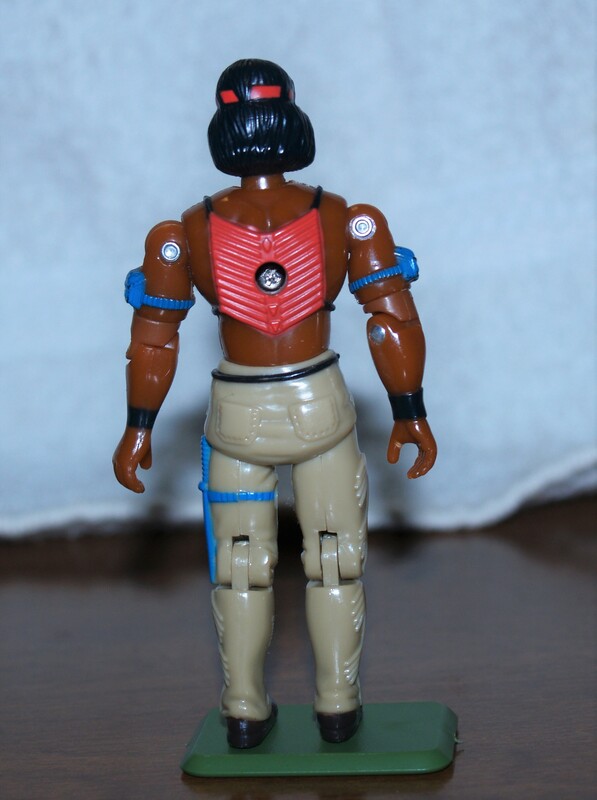 There is a bit of baggage to deal with since this figure looks so stereotypically Native American, but at least you can tell that Lanard put the same amount of attention to detail in this figure’s look as they did other figures. tagged with featured, Field Report, Lanard CORPS! ‘Thunderbird’ is a better code name than ‘Tracker Tom’, but seems more appropriate for a pilot. My favorite Native American code name is ‘Warpath’.